← How to print txt to jpg? A friend of mine doesn’t have Adobe Reader or Adobe Acrobat on her computer, and she asks me whether there is any way to convert Word to PDF and set PDF subject without installing Adobe products. Well, if she only needs to convert Word to PDF, she can use MS Office 2010 to save any type of Word documents in the format PDF. But she also wants to set PDF subject, so, the quickest way is to download document converter to get the job done. If you have the same problem, please read the following part to see how to convert Word to PDF and set PDF subject via command line. First, the document converter you are going to need should be a stand-alone application. Secondly, it should be a command line version. Third, it is supposed to have the capacity to convert all types of Word documents to PDF. And at last, it must support PDF subject setting. You can find a converter like this on line. If you ask my suggestion, I would like to recommend you to try the command line version of VeryPDF Document Converter. (Download). It is also named VeryPDF docPrint Pro and is able to convert all printable files to PD files. After you install it on computer, please go to open the command prompt window. VeryPDF Document Converter supports all Windows OS. In different OS, you need to use different method to open the command prompt window. 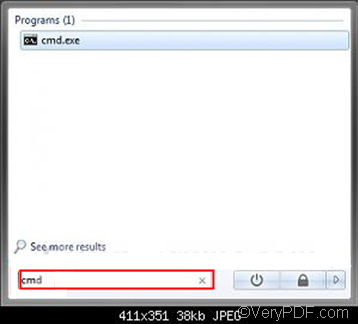 Taking the Windows 7 as an example, you should open the command prompt windows by clicking Start.> In the Start Menu search box area, typing cmd. > Then, press Enter on the keyboard. Depending on the following usage, please type a command line to meet your need: doc2pdf [options] <-i Document File> [-o Output file]. For example, “c:\docPrint Pro v5.0\doc2pdf.exe” –j “pdfcon” -i c:\*.doc -o d:\*.pdf can be used to convert all the Word files on disk C to PDF files on disk D, and set the PDF subject to be “pdfcon”. The directory of the executable file must be enclosed by quotation marks, –i must appear before the input file directory, and –o must precede the output file directory. Type a command line according to the location of the files. Don’t forget to press Enter after you type a command line. VeryPDF Document Converter enables you to convert Word to PDF in only three steps. Not only can it help you set PDF subject, but it can also help you set PDF title, keywords, page size, etc. If you are interested in the usage of this application, you can type the directory of the executable file in the command prompt window to see all the options, and try them one by one. This entry was posted in docPrint Pro and tagged command line, set pdf subject, word to pdf. Bookmark the permalink.